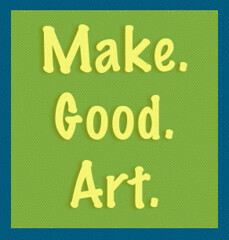 Make Good Art. Neil Gaiman’s Commencement Speech & My Thoughts on the Apocalypse. If you haven’t seen it yet, go watch Neil Gaiman’s commencement speech to the University of Arts class of 2012. Then watch it again. It’s inspiring for artists of all kinds, and is just the kind of message I need to hear every once in awhile. In fact, I may go listen to it again, right now. Yesterday I started daydreaming a post-apocalyptic short story idea. Or, maybe you’d just call it apocalyptic, because the story was kind of a “What if this happened?” kind of scenario. I once heard that if for some reason our food supply chain got cut off, grocery stores would only have a few days’ worth of food, and then we’d all be screwed. I wanted to verify that time frame, so I googled it. I found Modern Survival Blog and it blew my mind. Seriously. Go read it. I can’t imagine living with that mindset, let alone that several people appear to have made successful businesses around it. Just look at the ads. It’s such a goldmine of inspiration. Isn’t it kind of fun to think about which people you know might be closet survivalists? Then make them into the unlikely hero in the event of an apocalypse in your story. After I read Cormac McCarthy’s The Road, I spent a few days pondering what I could do to make sure I’d survive an apocalyptic event. I soon came to the conclusion that I would not be one of the survivors, and stopped worrying about it. At least, it would be very, very, unlikely. It is fun to think about it sometimes, though. If I had to get away, where would I go? When I was working at the convention center, I liked to imagine what would be the best place to defend against zombies or just other humans who want to steal our food. If I did survive, I would know how to make wool into yarn and then cloth, so I would have some talent to contribute to any kind of community formed by survivors. Chris could be the one to cobble together broken cars and turn one into a biodiesel fueled car. And maybe our husky would pull us on a sled in the winter. If “winter” still exists by that time, anyway. Haha. On a semi-related note, when I walked on the neighborhood trail yesterday, I was happy to notice all of the thimbleberry plants coming up everywhere! Thimbleberries are mostly like raspberries, but wild and with different leaves. Last summer we took a walk down the trail and snacked on berries all the way. I will know where to go to hide in the woods when the apocalypse happens and I can survive on berries! Do you like my picture? I just made it by playing around in Photoshop. It’s not very good, because I’ve never used Photoshop and I was just playing around. But that’s okay, because I’m learning, and right now it’s my best. Earlier, I dumped an entire salad on the floor before I even got to take a bite of it. That’s the kind of day I’ve been having. So I hope nobody cares that I made a crappy .gif with Photoshop to go with this post. It’s all Pinterest’s fault anyway. Just go listen to the commencement speech and forget you ever saw any of this! Yesterday I spilled coffee on my editing. I was just getting into a good groove, too. Then I had to bring the whole thing inside and let it dry out. The good news is that after it dried, I finished editing it! I actually just finished scribbling all over it, which I’m not sure counts as editing. The next step is to type up the new draft. After I finish this draft, I may post the story at Scribophile. I haven’t used it before, and I only just signed up about a month ago. They use a system called karma to determine whether you get to post your work for review. Before being able to post a story, I will have to earn karma points by doing a few thoughtful reviews myself. It seems like a great site, though I am nervous to take the step of offering my work for criticism. Another cool site I’ve found is Coursera. Coursera offers free online college courses from well-known universities. Heck yes I’m taking advantage of that! There’s no college credit or certificate offered, just the good ol’ satisfaction and pleasure of learning something new. I’ve signed up for Intro to Sociology and Fantasy and Science Fiction: The Human Mind, Our Modern World. I’m so excited! 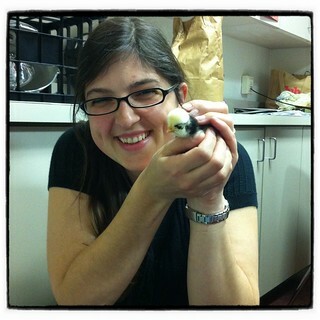 Check it out, one of our staff members brought her baby chicks to school! That’s me with one of them. She’d ordered 4 hens, and to keep them warm, they were packed with about 10 baby roosters! Nobody really raises roosters, apparently, so all they are good for is packing material 😦 Instead of killing them, she gave them away to another staff member who lives in a rural area and already raises chickens. Yay! Look at all that red! 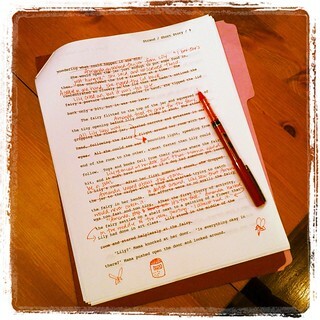 It’s fun, marking up the rough draft as much as possible, cutting out whole paragraphs and squeezing in whole new paragraphs between the lines. This is what double spacing is for! Just do me a favor, and don’t try to read the story that’s on that page. Now that I’ve said that I’m sure you will, if you weren’t already going to. I suppose I don’t care, knowing that it doesn’t look anything like it will when it’s finally done. I managed to get three more pages of this marking up done tonight after a wave of anxiety over the hugeness of my project hit me. It is so easy to get lost in the big picture, especially if you are a big picture person like me. I want to make an awesome website, with lots of pretty stuff like pictures and graphics, and I want it to be perfect, but how do I get there? Seeing the big picture without having a grasp on the small steps to take can be paralyzing. Instead of letting my discouragement and fear stop me, I got some groceries, a latte, and came back to write. Even if I can’t make a stellar website in a day (let alone learn the skills to even start making a website), I can write. I can edit. Journaling also helps me get past it and into the writing mindset. Also, I’m learning Photoshop and InDesign CS2. Chris and I have a legal copy of Adobe CS2, which is way old (the current software is Adobe CS6), but it is cheap for learning. It’s my guess (and fervent hope) that learning CS2 will give me what I need to adapt to the newer programs if and when I decide it’s worth it to purchase those ones. No use spending all that moolah when I don’t even know if I will end up using the program for anything but a hobby! Plus, the learning guides are cheap for the old software, too. 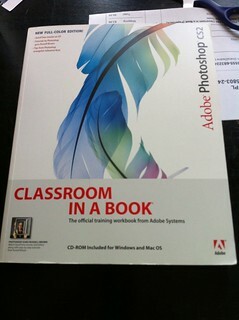 I got “like new” copies of Adobe’s official “Classroom in a Book” books for it for less than 6 bucks each, including the mandatory 3.99/each shipping price. Someone tell me if I’m grossly wrong in thinking that learning the old software will be at all useful, but until you do, I will continue to be excited to learn from my shiny newish books. How do you stick to a writing schedule? I find it too easy to say I’m too busy on weekdays. I’m tired in the morning, and when I get home from work, I feel like relaxing, not working my brain. I’ll have plenty of time on the weekend, I think. In order to make sure I keep up a consistent writing habit, I have learned not to count on the weekends. It always seems like I can get a whole lot of writing and other things done on the weekends, but that’s not always true. Social events can take up a lot of time on weekends. Sure, on one weekend I may get to spend 4-5 hours per day writing and working on website stuff and preparing blogs in advance. But as soon as I take that amount of time for granted, something comes up the next weekend that takes it away from me. My brain still expects it, because I had it the weekend before, then suddenly my weekend’s over and I didn’t make time for writing. It can be hard to keep up 5 hours of solid work, too. Since I haven’t developed any kind of routine or habit for working in long stretches like that (because I only do it on weekends), it’s easy to get distracted and off task. So that big chunk of time might not be as productive as my smaller chunks during the week. I do take advantage of the extra time I have on weekends to get more work done, and to do it at a more relaxed pace, but building regular time into weekdays (or work days, if you work on weekends) is key. Whether it’s getting up early and writing before work, or scheduling regular time to write after work, having a daily expectation to write will help you make progress on your project and exercise your writing muscles. It can be difficult squeezing regular writing into a schedule that’s busy with a full time job, but if it’s important to you, that’s what you do. I look forward to my evenings and weekends as time to work. It sounds strange, but it’s one of the ways that I know I should be doing it. 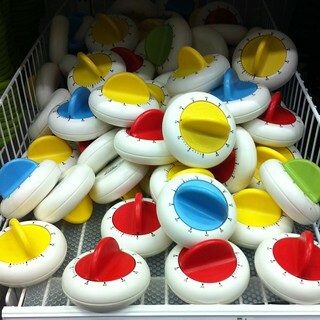 The timers pictured above were at Ikea. There were two different displays of them, and in both, all of the timers were ticking. Somebody had come by and set all of them! They didn’t go off while we were within earshot, which was strange since they are only minute timers, but it would have been funny to see! 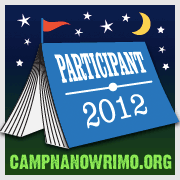 Camp NaNoWriMo, here I come! Well, it’s May already and that means it’s time for me to start preparing for Camp NaNoWriMo for June! I just got an email about all of the camp goodies that are in the store, and I want all of them! Just look at them. I want the poster. And the coffee mug. And the merit badges. And the camp care package. And the tshirt. All so cool! Since I am using Camp NaNoWriMo to motivate myself to revise my novel from November, I’m kind of cheating. I’m not starting a brand new novel for the 50,000 word goal. My thought is, though, that things like NaNoWriMo are a tool to help me accomplish what I already want to accomplish anyway. My revision will be an almost complete rewrite as well, so having a word count goal will still be a legitimate way of tracking my progress. And boy, do I ever need the motivation! In the past, when I’ve done NaNoWriMo in November, I’ve usually let it sneak up on me. I’ve never outlined, or planned very much ahead of time. This time, I am going to try outlining and some more advance planning. I still think November’s more spontaneous writing helped me–after all, I wouldn’t even know my characters or the world they’re operating in if it weren’t for all that writing! But now I need a clearer roadmap of what they’re doing so that this revision actually will improve the original draft. 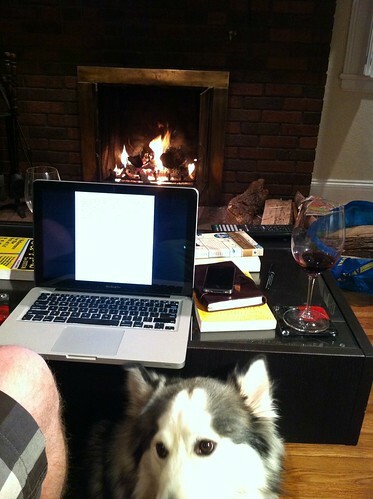 If you support my novel writing efforts, consider sponsoring me at my StayClassy fundraising page! I always try to donate a little bit to the Office of Letters and Light when I do NaNoWriMo, but now I want to try to support them even more! Their resources allowed me to teach NaNoWriMo as an afterschool class and spread the novel writing love to some awesome kids, and the whole program provides encouragement, support, and community to tons of writers all over the world. I love it, and if it sounds cool to you, consider supporting my efforts. Plus, your donations will help guilt me into sticking to my word count goal for the month! 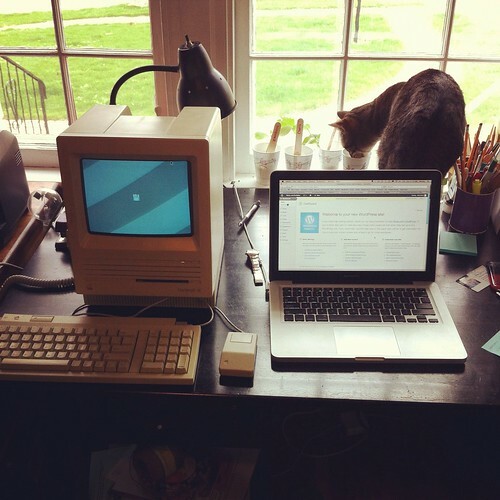 Check out this old computer! Chris’s boss was going to recycle it. It’s an Apple SE. He had it apart this morning and showed me the inside of it. The designers all engraved their signatures on one and then had a limited number of the cases made with the engraved signatures reproduced. This was one of them. So it has Steve Jobs’ signature engraved inside it, along with at least a dozen other people. So cool! I’m currently in the process of building my own website for this blog to move to. I will have my own hosted space with my own domain name. Fun! It will be more than just a blog, but for now I’m just learning the ropes. Things have changed a lot since I made my fist website with Netscape Composer and hosted it on Geocities. That was when I was in seventh or eighth grade. Back then, people did a lot of different things with personal websites. One of them was creating “adoptable pets” for other people to have on their websites. Basically you “adopted” a picture of a pet and put it on your site. I created my own adoptable dragons. They started out as images of eggs that I sent to the person. When their egg “hatched,” I sent a picture of a baby dragon. Then there was a young dragon, and an adult. All of these I made by drawing the dragon pictures, outlining them heavily in pen, then scanning them, touching them up in an editing program, and filling in the line drawings with different colors. It was fun. Yes, times were different then. Now, I’m learning a new set of tools, and updating my knowledge of HTML (and CSS). I’m using WordPress.org to build my website. WordPress.org is different from WordPress.com (where this blog is currently hosted) in that you download the software and install it on your own server to use as a back end for your website. It still has themes, but you can edit the themes and customize more. Last night, I was trying to play around with it and got discouraged. There is a LOT you can do with WordPress, which also means that there is a LOT to learn. I have to keep telling myself what I tell the students I work with: If it’s not hard, then you’re not learning anything. You don’t learn from doing things that already come easily to you. You learn when you are challenged. Yes, some things will come more easily than others, but the harder it is, the more you will learn if you stick with it through the mistakes and the pitfalls. One of the goals I had for today was to change the colors of my theme. I know that I wanted some kind of warm but earthy color scheme. The trouble is, I always get afraid of getting sick of it. Then, I found myself getting stuck going back and forth trying different colors that didn’t quite work, refreshing the page, trying a new color. It was tedious. Well, thanks to Google, I found this: Color Scheme Designer. You can choose different types of color schemes and drag them around the color wheel to get a preview of how colors will look together. Way easier than my trial-and-error combinations! And pretty. I’m pretty sure someone showed me this once in relation to yarn and knitting. I can tell I’m going to be slightly obsessed with this for awhile while I learn. But, I’m off to a wedding tonight, so I guess I have to take a break.